NO EMPLOYEES TO WORRY ABOUT! What you will have is the ideal vehicle to achieve your dreams and goals as you create an enviable stream of income? When you join Trévo with a Power Start Business System, you are eligible for deep discounts off retail product prices. As you create a following of satisfied and loyal product customers, you will enjoy a handsome profit on their monthly purchases. Plus, you will have the opportunity to build relationships with other people who, like you, are motivated to succeed. These people will form the core of your Trévo organization and, together, you have the ability to quickly create substantial, ongoing earnings. What does it mean to be a Life and Health Coach? *See disclaimer in footer for earnings potential and details. Why should you become a Life and Health Coach? Have you ever wished that you had invested in Google or Apple before they became global giants? The forward-thinking people who recognized the potential in these unique ground floor concepts seized the opportunity and are now enjoying incredible rewards. Are you looking to create extra income for yourself? Are you a stay at home mom needing to support your family? Becoming a Trévo Life and Health Coach is the step you should take. Today you hold in your hand the opportunity to be a part of another global giant, one whose potential is unlimited. So, the question is, are you a forward thinker? Can you see the overwhelming success awaiting you in Trévo? Do You Know a Life and Health Coach? This person is your upline, look to them for help with enrollment and finding out more about the Trévo opportunity! Are you on social media? Like our Facebook page and Follow our Twitter page and find a Life and Health Coach whose team you can join! OR We can locate a Life and Health Coach for you when you enroll. Choose the enrollment system that will best suit you. You may upgrade any time! You receive one customizable personal Trévo website! You will receive one of each Trévo sales tools & one Trévo Quick Reference Guide for every bottle. Access to Trévo’s extensive back office system for one year! Now that you have chosen an enrollment system, here is how you enroll. To enroll via phone call +1 405.942.3200 also toll free at +1 877.942.3255. Our exceptional support staff will guide you through your the process of enrollment. Navigate to the “Join Now” tab in the Menu or click the button below to begin the enrollment process. The opportunity to ask your questions! Download the Ingredient Glossary PDF which lists all of our ingredients! Purchase printed material to share this amazing product with others! You can do this from your back office website after you enroll. Your enrollment kit contains information all about Trévo, including our one-of-a-kind compensation plan and our luxury car program. Know this information by heart, and you are one step closer to your Trévo extraordinary lifestyle. Note: The testimonials on this website are individual cases and do not guarantee that you will get the same results. The information provided by this website or this company is not a substitute for a face-to-face consultation with your physician, and should not be construed as individual medical advice. 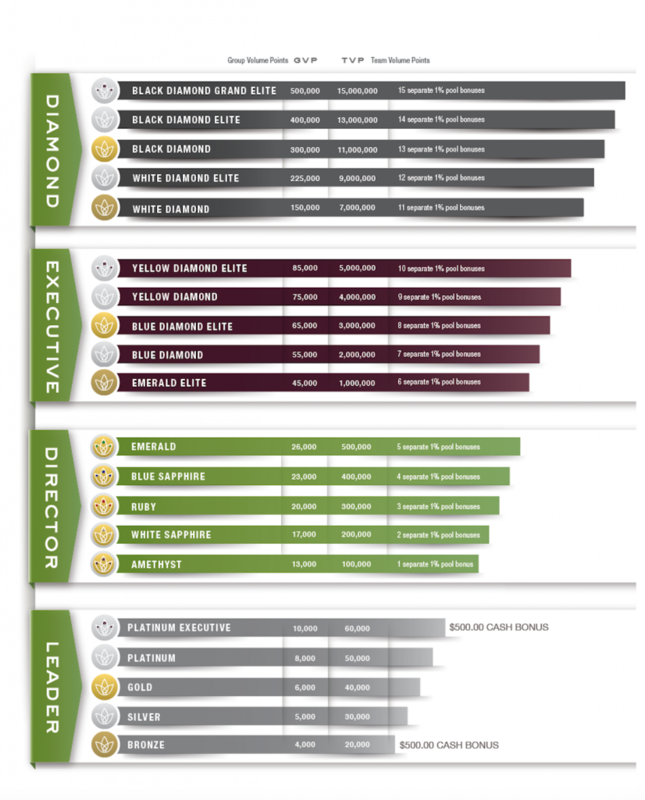 The Compensation Plan is one of the best resources available! This document fully explains the compensation plan and gives powerful examples about commissions, explains the compression process, and details bonuses and recognition pools all in local currency. Even if you are not comfortable speaking to large groups, do not worry! Practice speaking to a potential customer one-on-one with the help of the Empowered Presentation. The Empowered Presentation presents the Trévo product and opportunity in a user friendly presentation. Attendees to your presentation can expect to learn about the 3-phase formula that allows Trévo to fill nutritional gaps, explains the unique single-line matrix system and details every one of the 8 Ways to Make Money. Whether you are presenting in front of a large crowd or just to a few people in your home you should always take every opportunity to give the Trévo presentation. You can do this online through platforms like Skype or GoToWebinar or in person at our many seminar halls all around the world. The first step is to watch others present the product and opportunity so that you can perfect your own presentation. Find a seminar in your country. Listen to a conference call. Connect on social media! The menu bar contains all links to social media outlets. Attend conferences and seminars in your area as often as possible. Now is your time for success! Trévo has an amazing program that recognizes coaches as they advance with generous percentage pools. The graphic below shows this great system in detail. What is your goal? Check out our YouTube channel for videos! Learn about our luxury car and trip award programs! Drive in style with a Trévo powered luxury vehicle. Read more about this exciting opportunity by navigating to the Luxury Car Program page to read all the qualifications. Where will Trévo take you? Trévo has developed a simple to follow, step-by-step business system for our Life and Health Coaches, based upon its founders real-world experience in building multi-million dollar companies through successful entrepreneurship. This remarkable wealth of expertise, teamed with cutting-edge business-building tools and technology, can put your dreams on the fast track to reality. Speaking of cutting-edge, did you know that the health and wellness industry is on the leading edge of wealth creation? Or that it is creating more millionaires right now than at any other time in history? Currently, the wellness industry is a $500 billion dollar industry. That in and of itself is pretty huge, but according to Paul Zane Pilzer in his blockbuster best selling book The Next Trillion, this same industry is projected to hit well over a trillion dollars in the next few years, creating hundreds of thousands of millionaires. Who would not want to have a piece of that kind of staggering wealth? When you become a part of Trévo, you become a part of an industry that is literally exploding in growth and profit. You may simply be interested in adding to your current income, or you may be a visionary at heart one who sees the amazing possibilities that this remarkable opportunity presents. This exciting six-minute opportunity call features Trévo CEO Mark Stevens and several of the Life and Health Coaches who are stepping up to seize this remarkable new opportunity to make their dreams become reality. * 6 Minutes To Money is a quick, yet powerful, presentation tool when you three-way a prospect into this call. DISCLAIMER: The earnings potential portrayed in this literature is not necessarily representative of the income, if any, that a Trévo Life and Health Coach can or will earn through participation in the Trévo compensation plan. Any figures herein should not be considered as guarantees or projections of your actual earnings or profits. Any representation or guarantee of earnings, whether made by Trévo or a Trévo Life and Health Coach, would be misleading. Success with Trévo results only from successful sales efforts, which require hard work, persistence and leadership. Your success will depend upon how effectively you exercise these qualities.